A few weeks ago, as the never-ending much-needed rain trickled to a drizzle, my resident hummingbird enjoyed fluffing his feathers after a well-deserved feeding. 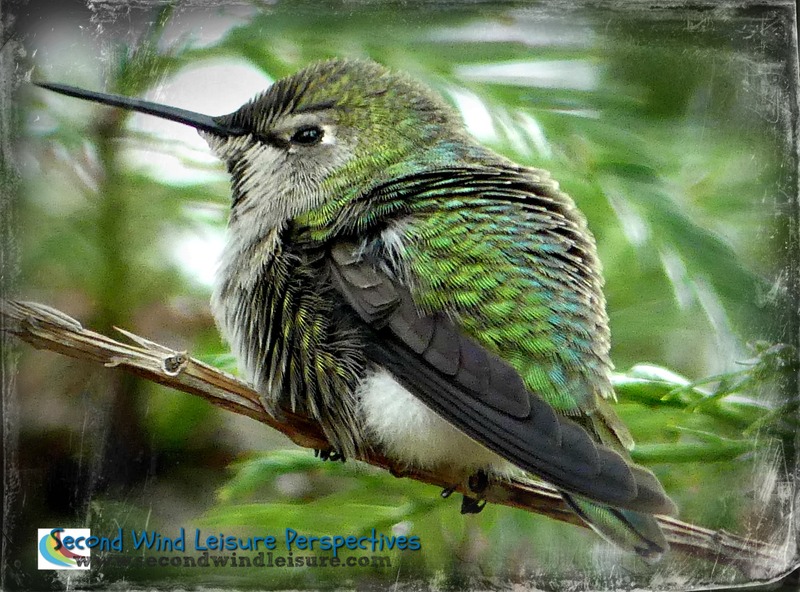 We are all used to seeing hummingbirds in flight, we may forget they actually perch! Photographed with my Panasonic Lumix FZ300 in full zoom. Cropped and framed with PicMonkey premium. I have also taken great macro shots with my Samsung Galaxy S5 phone, too, so don’t be afraid to play along! What a great macro! Love the humming bird with its ruffled feathers. That IS a great photo Terri! WOW!! I’m so amazed that you actually got a still shot of one! Just to let you know, I’ve had to turn off my home net. Still trying to post 5 days a week, but won’t have much time to read others’ blogs. You’re welcome. Yeah, I’m sad, but as soon as I get some bills paid off, it’ll be back! That teaches me for charging stuff I can’t pay for immediately! Absolutely love hummingbirds, but we have to wait till late spring, early summer before they make it to us. I put my feeders out early trying to entice them to my abode…..
We’re pretty lucky to have moderate weather. This hummer family is territorial! Great photo! Love the details and what a cutie! Thank you, Judy, he was a great subject! That is a hummingbird? I figure I’ve never observed one very close—the hues are amazing! !..Such a cutie! Incredible catch as well.. It is rare to see them perched, and thank you! Stunning! what a wonderful capture and such a beauty up close!! Thank you! Spring is looming, hoping to see more birds in my backyard. Stunning, Teri. Thanks for entering this photo in the challenge! Thanks, I made it in the nick of time! That really is an amazing hummingbird photo! Thanks, PJ, isn’t strange to see them perched? It is odd to see them perched. I rescued a hummingbird once that my cat got ahold of and injured her wing. I kept her in a cage until her wing healed. She was so sweet. I would take her out of the cage on my finger and kiss her little tiny head. That was a wonderful experience! Aww, how sweet! They seem to be loyal birds, too. They are sweet! She was a loyal bird too. She got to where she wasn’t afraid of me at all. I had her in the cage in my kitchen and I thought she might like to have the cage covered so it would be calmer for her. She started making a fuss until I took the towel off the cage. Haha! Awesome photo! I love hummingbirds, especially. That’s a wonderful hummer capture. What kind of hummingbird is it? We don’t see them here from September through sometime in April. So sweet to see your hummer. They have been here all winter! I think they are Allens’ hummingbirds. This one has the ruby throat. They so seldom sit still – nice that you were able to get a picture! It’s funny how they will feed then fly up a couple of feet above the feeder, which is in a pine tree. This is an amazing shot, Terri. It definitely puts me in the ‘Spring spirit’! Thanks, Donna! We are seeing a few blossoms in the trees around here! More rain expected and more snow in the Sierras in the way! That’s a hummingbird? I guess I’ve never seen one up close before—the colors are amazing! !